So this is a variation of a variation of a variation...but geeze 'o man is it good. What, you may wonder, am I talking about. Garlic mayonnaise and it's many variation. The south of France (and Italy and Spain) have Aioli (the French word for garlic is ail), in the Middle East there is the potent Toum (which simply translates as garlic), and in Greece there is Skordalia (not sure of the etymology of this one). And then there's my most recent version I'll call beaonnaise [sic]. But I'm jumping ahead. I love to eat a sandwich at lunch, and I also love the flavor of garlic. And in my continued effort to eat healthier (minus the eggs and low grade oil in most mayonnaise) I made this and it is really easy (and super delicious). 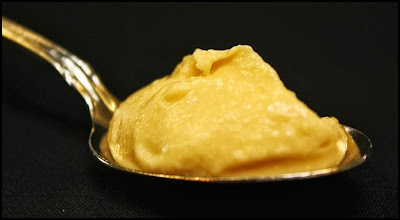 I just recently found out that beans--and especially chickpeas--contain lecithin, which of course is the same emulsifying agent that is in egg yolks. And we all know that beans in general are really good for you, and so is olive oil, so I replaced the egg yolk with chic peas. Delicious. You can cut down on or increase the amount of garlic as you like, and with the aid of a blender this will take about 2 minutes to make. And because there are no raw egg yolks this will last a while in the fridge...but it likely will not because it is so delicious. Combine all of the ingredients except the olive oil in a blender and puree. While the blender is running add the olive oil in a thin stream. Continue to blend for 30 seconds, or until the beaonnaise is light and fluffy.